Possibly one of the hottest photo editing topics currently is Photoshop Frequency Separation. It’s also one of the most confusing; partly because it’s hard to understand what’s happening and partly because it sounds complicated. In this tutorial, I’m going to explain how you can use a simple version of Frequency Separation in Photoshop. In the past, most of the information and tutorials describing Photoshop Frequency Separation covers fashion, beauty and portrait retouching. If you’re a landscape photographer, you’re probably left scratching your head by all this and thinking this doesn’t apply to me. Well actually, you can still use Frequency Separation and a couple of techniques come immediately to mind. Firstly, you could sharpen your image without accentuating image noise. Secondly, you can create a very effective Orton effect with lots of control. In the following video, I explain how to create a Photoshop Frequency Separation. After that, I demonstrate how to use this for sharpening before applying an Orton effect to improve the photo. If we break down an image, we find it’s made up of colour and detail. In Frequency Separation all we do is separate these two things into two separate layers. In one layer we see the colour but no detail and in the other, we have the image detail but no colour. Here’s an example of what these two layers look like in Photoshop. In this image, you can see image A contains no detail but all the colours. Image B contains all the detail but no colour. Image C is what you get when you combine the two Frequency Separation layers. Let’s have a look at how to create these layers in Photoshop. To start, open the image in Photoshop that you want to use for the Frequency Separation. Duplicate this image to two new layers in the Layers window. Call the first layer Colour and the other Detail. Select the Colour layer and apply a blur to it; the best filter to use for this is the Gaussian Blur filter. Use a Radius of 5-10 if you want to use the Frequency Separation for sharpening, or 15-30 for the Orton Effect. This creates a layer with colour but no detail. Now click the Detail layer in the Layers window and select “Image | Apply Image…” in the menu. This will display the “Apply Image” dialog as shown below. In the Apply Image dialog select the Layer to be the Colour layer that you have previously blurred. Set the blending mode to be “Add” and the Scale and offset to be 2 and 0 respectively, as shown in the illustration. At this point, the image will probably look a little strange, but when you click the “Invert” option you will see it change to grey. You now have your two frequency separation layers which separate the image colour and detail. The Colour layer should be below the Detail layer in the Layers window. To make the two blend and create a normal looking image, set the Blending Mode for the Detail layer to be “Linear Light”. As soon as you do this the grey layer will seem to vanish and you're left with what looks like the original image. But if you hide the Detail layer, the image will appear blurred. You have now created a simple Frequency Separation in Photoshop. There are two ways you can create a sharpening effect with the Frequency Separation. You can apply these techniques separately or combine them. Apply sharpening to the Detail layer using a sharpening filter like Smart Sharpen or Unsharp Mask. This is a traditional approach but has the advantage that you’re only sharpening genuine detail in the image. Gradually reduce the Opacity of the Colour layer in the Layers Window. As you reduce the opacity, the Detail layer starts to blend with the Background layer to create a sharpening effect. Take care not to reduce the Opacity of the Colour layer too much though as it can start to look unnaturally sharp. My own personal preference is to combine the two methods together. Start by reducing the Colour layer Opacity, after which you can sharpen the Detail layer. If the effect appears too strong, you can further adjust the Opacity of the Colour layer. The Orton effect was created by Michael Orton in the ’90s, working with slide film. Today, photographers the world over continue to use the technique. Now though, rather than working with slide film, we have digital tools that make the task somewhat easier. To create the Orton effect with your Frequency Separation, start by using a larger blur radius to create the separation. In the Layers Window, reduce the Opacity of the Detail layer. As you do this, you start to see the blurred Colour layer become visible. 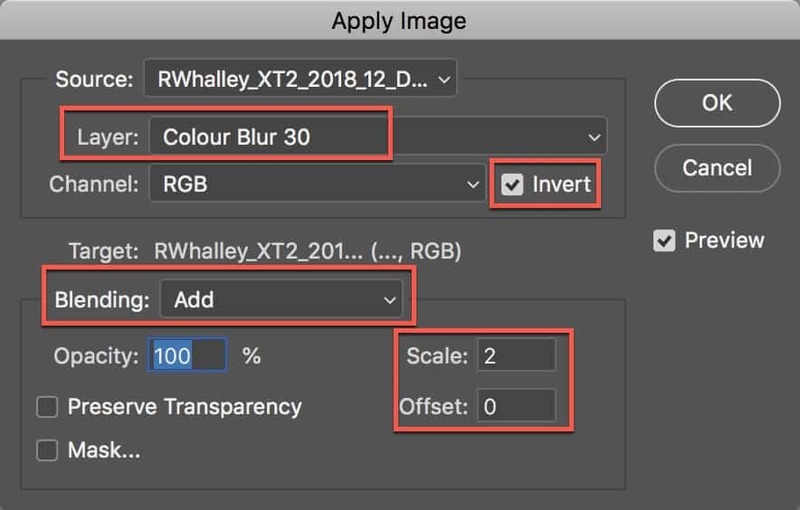 Create a second Colour layer by duplicating the first. Rename this to be “Soft Glow” and place it above the Colour layer in the Layers Window. Change the Blending Mode of the new layer to be “Soft Light”. This will create a strong contrast and colour adjustment and a glowing effect. Adjust the Opacity of the new Soft Glow layer to control the strength of the contrast adjustment and effect. In this tutorial, we have looked at a simple way to create a Photoshop Frequency Separation. 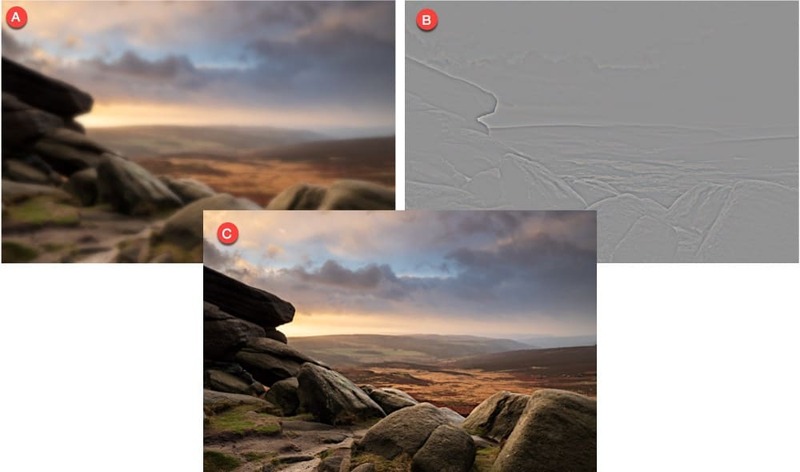 We have also examined two ways you can use this to apply effects to your Landscape Photography. If you haven’t done so already, be sure to watch the video above. It contains further information you might find useful in creating your Frequency Separation. If you watched the video, you will have seen I used masks to better control the Frequency Separation. Try the following tutorial if you’re not familiar or comfortable using Photoshop masks.